The good news is that scanning can help rescue and revive those treasures from the days of analog. The bad news is that digitizing those old photographs yourself can be a formidable task. Scanning and retouching each photo, slide, or negative would take an untold amount of your time and energy. Thankfully, there are now professional scanning services that will do all the tedious work for you. I tested three different scanning services to see how they stacked up. I placed orders with these three scanning companies: ScanDigital.com, DigMyPics.com, and ScanCafe.com. All three services have similar approaches to customer service, and each successfully completed the orders I placed, delivering scans and returning the original materials to me in good condition. However, the services did have varying strengths and weaknesses in the following areas: placing the order, ongoing communication, turnaround time, scan and retouching quality, after-order support, and pricing. For each service tested, I prepared a package that contained 15 images covering the three main kinds of standard color media: five 35mm slides, five 4-by-6-inch prints, and five 35mm negatives. Test packages are a good way to go when considering a new scanning service. The financial investment is relatively low, and you can minimize your risk by sending images that you have duplicates of. If everything goes well, then you can send off larger quantities with some assurance of a positive experience. To judge product quality, I ordered the highest resolution scan each service offered. The test files were opened directly from the shipped DVD into Adobe Photoshop CS4. I printed images on 13-by-19-inch paper from a Hewlett-Packard Photosmart Pro B8850 printer. The resolution was set for 300 pixels per inch (ppi), which yielded an image size of 17.8 by 12 inches. No image adjustments were applied. In the print dialog box, I let the printer manage the colors. I used original HP ink and HP glossy paper. The first step in outsourcing your scanning is to gather all of the pictures you want to preserve. They may be stashed away in different areas of the house, storage spaces, or in the hands of friends or relatives. You don’t need to limit your collection to standard-size prints, slides, and negatives. Most scanning services will also accept less-common media, including APS film, medium and large format prints and slides, transparencies, scrapbook pages, and disk negatives. Each company provides a list of their accepted formats online. For the most part the sites recommend sorting your images by keeping prints, slides, and negatives bundled with like kind. In other words, don’t toss a mix of media into a box and expect the service to sort it out for you. If your prints are in albums or slides in carousels and you don’t want to take them out, that’s OK. For a slight surcharge, the scanning company can remove, scan, and return your prints and slides to their rightful place. The better you label your materials, the quicker the company can process them. I put negatives and slides in Print File sleeves to protect them and included my name on each sleeve. I put prints together in a manila envelope with my name on it. (Some companies request that you put your slides in boxes instead of sleeves.) If you want your images to be separated into groups, divide and label each batch clearly. The final scans will be sorted and named accordingly. Finally, I put the envelopes and sleeves into a sturdy box and mailed it off. My materials from each service were all returned to me in my original packaging, and they were in good shape. Placing your order online with a scanning service is a fairly straightforward process. Typically, you create an account and then let the service know a little bit about the type of media you want scanned, how many items of each type will be in the order, the resolution at which you want them scanned, and the type of digital media you’d like in return. You can have your scanned photos burned on a CD or DVD, stored online, or saved on an external hard drive. I like to get my images on DVD and have the option to download them online too. The DVD serves as a nice archive, and it will play on all of my Macs. The online files are convenient for quick downloading. Of the services I tested, ScanDigital had the easiest ordering process. I was presented with a short series of decisions that were easy to understand, such as the pricing plan, shipping method, and digital format for final scans. The easiest way to ship materials with ScanDigital is via UPS. There is a $10 upfront charge for two-way shipping, and once you pay it, you can print out a UPS shipping label. The online order form was slightly more intimidating with DigMyPics. I had more decisions to make about the digitizing process with this service. This isn’t necessarily a bad thing, but DigMyPics does seem more geared toward photographers who have specific preferences about scanning resolution, while ScanDigital didn’t require much upfront knowledge about the scanning process. 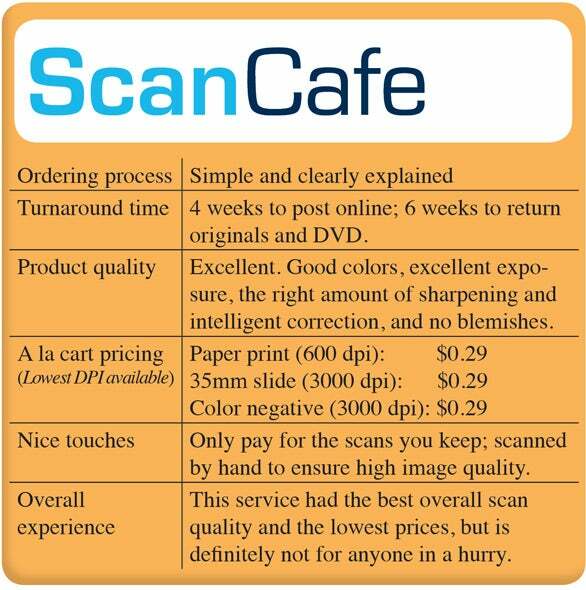 Ordering from ScanCafe was more like ordering from ScanDigital--clear and straightforward. All three sites have a terrific How It Works page that includes information about the scanning process, tips on how to pack your shipment, and answers to FAQs. Of the three, ScanDigital and ScanCafe have a slight edge for ease of ordering. Return your scanned old photos to their former glory with a few easy adjustments in iPhoto.